Spoiler Alert, 2018 is a new year which means we all have New Year’s Resolutions. 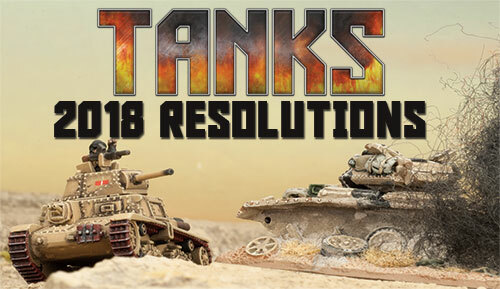 Hopefully some of you have made a resolution to build, paint and play more TANKS. Ironically that’s one of ours too, except we are adding ‘hang out in our new Facebook Group more’ to the list. Behind the scenes the TANKS team has been busy working on a pile of new content for this year but we have been so focused on the hidden stuff that we have not taken the time to get out and (virtually) catch up with the community enough so to help us we’ve created a new Facebook Group which will replace our forum on the TANKS website. So, what is on our agenda for this year? We also have plenty on the drawing board for the second half of the year with new releases for our Soviet players so hang on tight! So where does this leave us now? Our first job is to hang out in the TANKS Group more, so head over there and tag one of the TANKS team with your thoughts and we will get back to you ASAP.